Mapfre Stadium, previously known as Columbus Crew Stadium, is a dedicated soccer stadium located in Columbus, Ohio, and is home to Major League Soccer Side Columbus Crew. 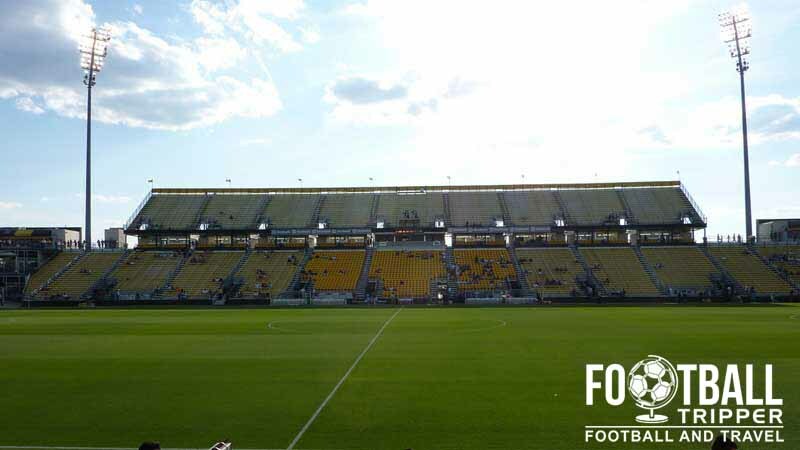 Crew stadium holds the honour of being the first purpose-built professional soccer stadium in the United States, and the seating capacity is a solid 20,145. 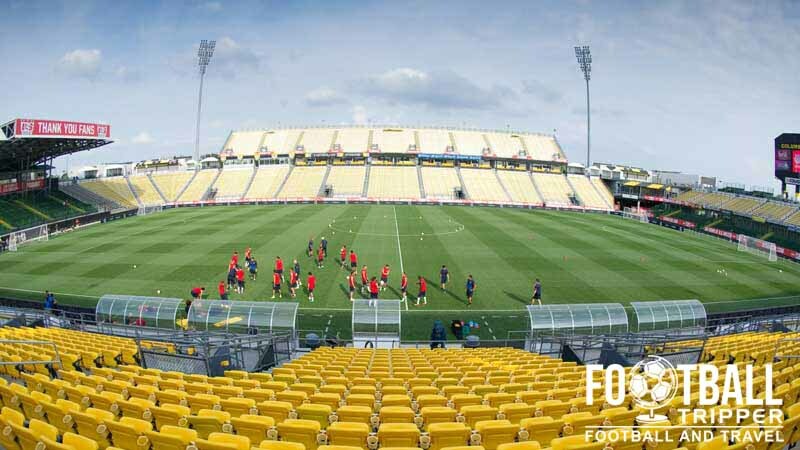 Constructed in 1999, Crew Stadium was the first purpose-built Soccer Stadium for a professional team in the second era of American Soccer, with Columbus’ stadium setting the benchmark for other clubs such as New York Red Bulls and Real Salt Lake to follow. Estimated to cost around $40.3 million dollars (adjusted for inflation), the stadium opened with a capacity of 22,555 although today that figure sits at 20,145. Before moving to their new stadium Columbus Crew played their first three MLS seasons at the 90,000 capacity Ohio Stadium located on the Campus of the state University. Large sections of the ground were sealed off with the capacity reduced to around 25,243 which dampened the atmosphere and ultimately the size of the pitch proved to be too large, resulting in poor views from the stands, echoing Europe’s ongoing battle with Athletics Tracks. Thankfully the club’s owner Lamar Hunt recognised this and chose to invest in a brand new stadium through the Hunt Sports Group, with the value of the Oil billionaire’s vision recognised by fans and critics alike. 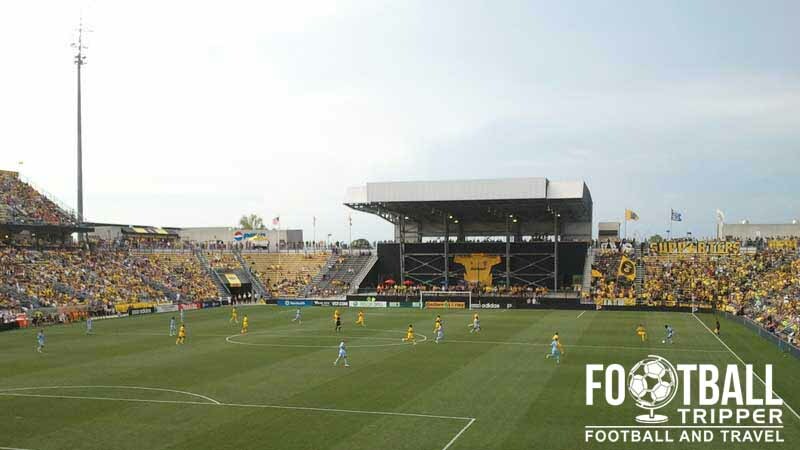 The 2010 Showcase Issue of Stadia Magazine nominated Columbus Crew Stadium as the most influential stadium of the last decade, with the ground inspiring virtually every other MLS team to at a minimum assess their current playing venue. The opening fixture was played on the 15th May 1999 against the New England Revolution, and since opening the ground has hosted numerous International fixtures. For example, in 2003 the arena was used to host six matches of the Women’s World Cup, and for the U.S National Men’s Team, Crew Stadium has hosted at least One World Cup Qualification match for each tournament since the 2002 World Cup. Columbus Crew Stadium is comprised of four stands: North, East, South and West. Although it doesn’t appear is if there is an official area per se, in recent seasons visiting supporters have tended to be allocated seating within the south stand between sections 115 and 117. With the exception of the stadium concourse where Budweiser is available on tap, there aren’t any pubs immediately within the environs of Mapfre Stadium. Thankfully a few blocks away to the left of Crew Stadium is the Northern Campus of Ohio State University. Located between the two areas there is the long ‘N. High Street’ which is lined with an abundance of bars and restaurants. To name but a few there is Eddie George’s Grille 27 which is an American Football themed bar, The O Patio & Pub and the Library Bar. The Fourth Street Bar & Grill is usually lively on matchdays as it is one of six official supporters pubs as recommended by Columbus Crew’s website, and if sometimes referred to as Crew Supporters Union. South-east of the ground there is a McDonald’s which often does a roaring trade on game days, as does the Wendy’s and Hudson Street Pizza which are both located five minutes north of the ground. Otherwise your dining options are either within MAPFRE stadium itself or on North High Street next to Ohio State Campus. Either way you will certainly not starve! The official Crew SC shop is located on the South-west corner of the stadium inside Gate 5. Besides the official online store, this is the best place to purchase your Black & Gold merchandise with stock ranging from customizable jerseys to pens and pencils. Matchdays: 90 minutes before kick-off when the gates open. Columbus Crew merchandise before rebrand of both the MLS and Columbus Crew Logos. 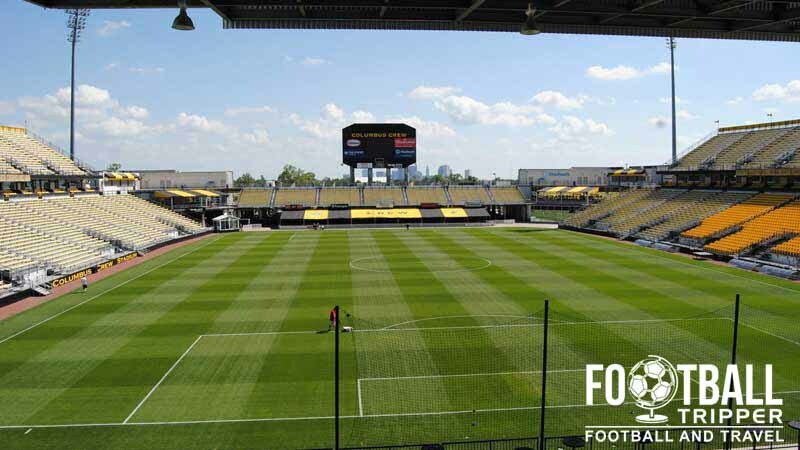 It doesn’t appear as if Columbus Crew F.C currently offers soccer fans the chance to undertake a tour of the Mapfre Stadium. If this changes we’ll be sure to update this section. Single ticket prices for the 2015 MLS season start anywhere between $19.00 dollars and $25.00 depending on the opposition, however usually for the majority of matches the cheapest ticket will set you back $23.00 bucks. 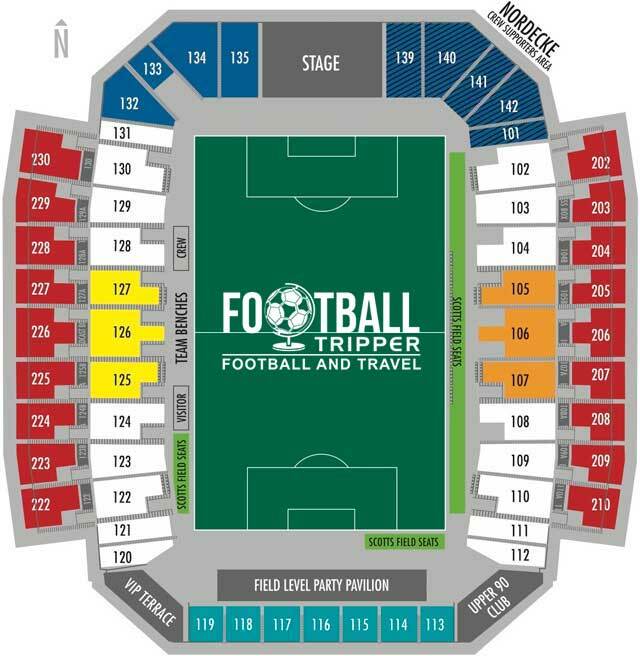 Once you have added booking fees and tax on to ticket prices you’re probably looking at around $30.00 for cheap seats situated towards the corner of the pitch and behind the goal. Back towards the half-way line along the side expected to pay up to twice as much with $50.00 being a reasonable estimate. To find seats and play around with the interactive seating chart visit Columbus Crew’s official Ticketmaster page. The ticket office at MAPFRE Stadium is open Monday – Friday between 9.00 am – 5.00 pm, and is open from 10.00 am onwards on the day of matches. The Mapfre Stadium is sandwiched between the highway and railroad tracks, approximately 5.6 miles of Columbus city centre. The main entrance gate of Columbus Crew’s Stadium which has recently been renamed to Mapfre Stadium. At the stadium there are four official car parks, however the VIP and B Lot areas are reserved solely for those who possess Season Parking Passes. General Parking is available to fans on a one off basis by entering taking the I-71 and turning onto 17th avenue from exit 111. Once you can see the ground follow signs for gates 14, 15 and 16 to enter the parking lot. The distinctive yellow and black colours are reminiscent of Germany’s famous Borussia Dortmund club. Officially the club refer to the yellow as Gold however. The Sheraton on Capitol Square is the official hotel recommended by Columbus Crew, with rooms starting at around $129 per night. It is located 4 miles south towards downtown with the Holiday Inn Express north of the stadium just across the I-71 a much closer option.